Home > ya highwayers > Our New Look! YA Highway started in 2009, with five enthusiastic writers just beginning to explore YA, publishing, and blogging. Today, our eighteen past and present members have sold 33 book deals, written 1850+ posts, welcomed hundreds of guest contributors, and given away a ton of books. But most importantly, we’ve made innumerable friends in the reading, writing, and publishing communities, and we’re so grateful for your support. As our careers grow, it’s harder to blog, but we’ll continue to create content as time allows -- and of course, we’ll keep sharing everything from the helpful to the ridiculous over on Tumblr. Meanwhile, we’ve redesigned the main site to make our resources and features easier to find. We’re still doing some tweaking, but click around to find writing advice, agent and editor interviews, features on your favorite authors, cover reveals, giveaways, our personal projects, and more. Field Trip Friday and the Spookies writing game are still going strong, and keep an eye out for new features like monthly book lists, a weekly writing inspiration post, and updates to our Publishing Road Map. Thanks again for six great years! Looks good. Nice, neat, clean, and easy to maneuver through. Good job, YA Highway!! Hi Kevin. We actually don't have any ads on the site, nor do we make any money from it. 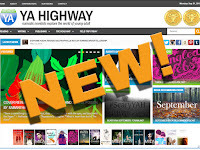 Dystel & Goderich is an agency; YA Highway is a group of volunteers and all of our resources were created in our free time, free of charge to readers. I'll leave off the debate over what's "classy" here. Unfortunately, I find the new look slow to load and difficult to find my way around in. I'd like it if the new stuff was front and center and the features were a little reduced. I keep clicking them and realizing that I've read them before. And anything that changes in a time loop is distracting and keeps me from being able to find things. It's very nice and shiny, but the old colors were calmer. Miss them.